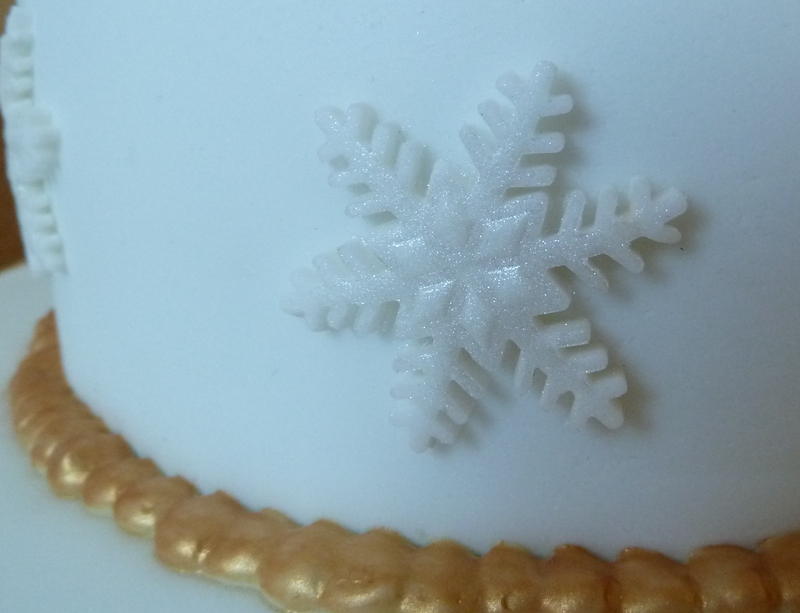 The decorations are made from sugarpaste, using a snowflake cookie cutter (for the larger ones) and a snowflake plunger cutter (by PME, bought from Amazon) for the smaller, more intricate ones. The ‘gold’ sugarpaste I coloured using the ‘caramel/ivory’ shade of Sugarflair paste colouring, mixed with a smidgeon of ‘tangerine/apricot’. They were then brushed with ‘Royal Gold’ edible lustre dust (also by Sugarflair). 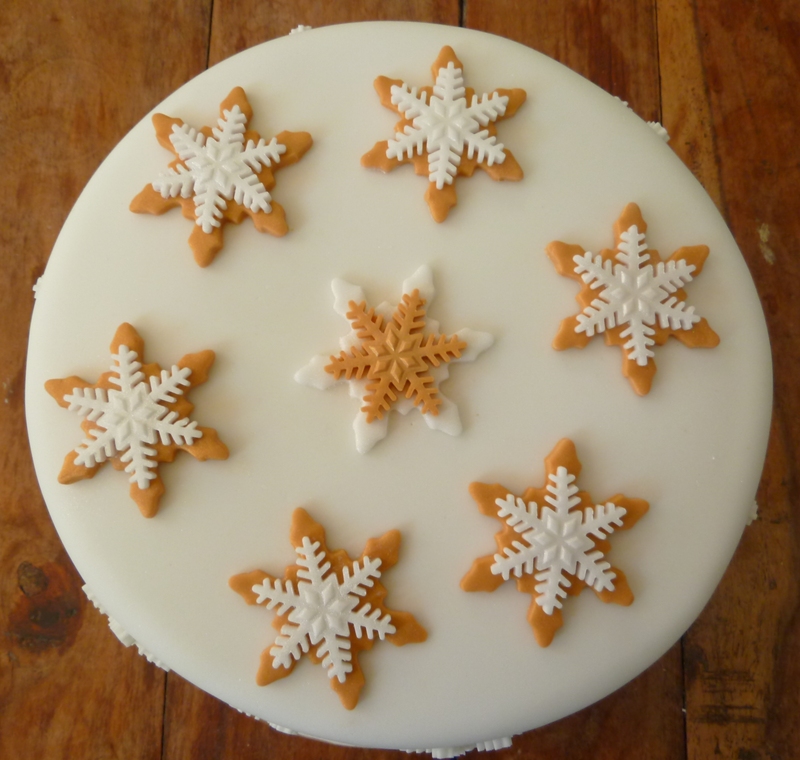 The white ones were brushed with ‘Snowflake’ edible lustre. To stick them down I painted the underneath with boiled water and manoureved them carefully with a palette knife and cocktail stick. 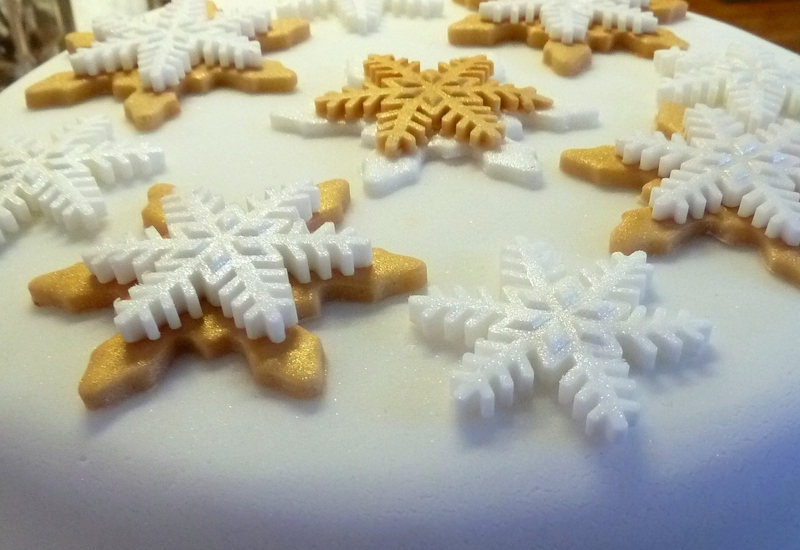 They were quite delicate, so it was a tricky business! 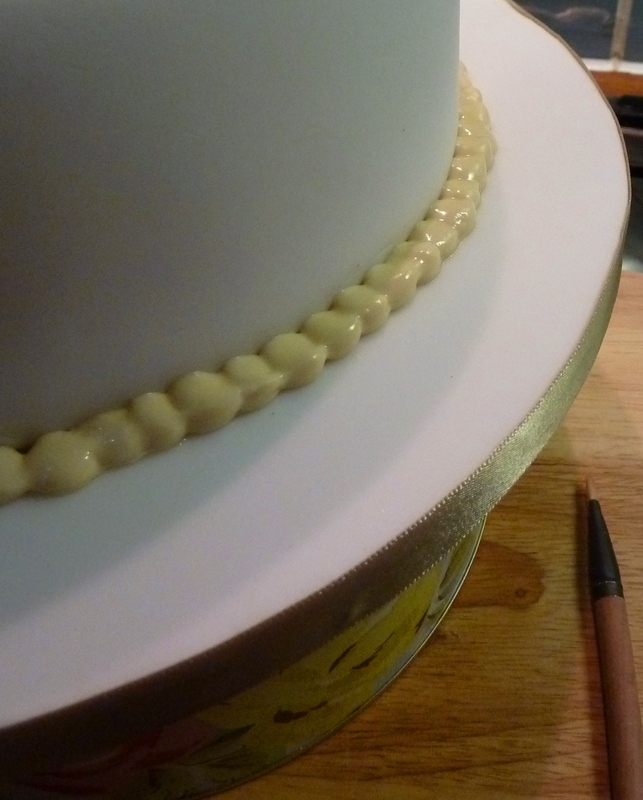 The gold trim piped round the bottom is made from royal icing, coloured with the ‘caramel/ivory’ paste, and piped from a piping bag through a No.2 nozzle in a trail of pearls. Once it had hardened, I painted it with the Royal Gold lustre, mixed with a little bit of vodka, left it to dry, then frosted it with a dusting of dry lustre. The boards are also covered with sugarpaste, and trimmed with gold satin ribbon. Making these was a pretty big effort, involving lots of stages. 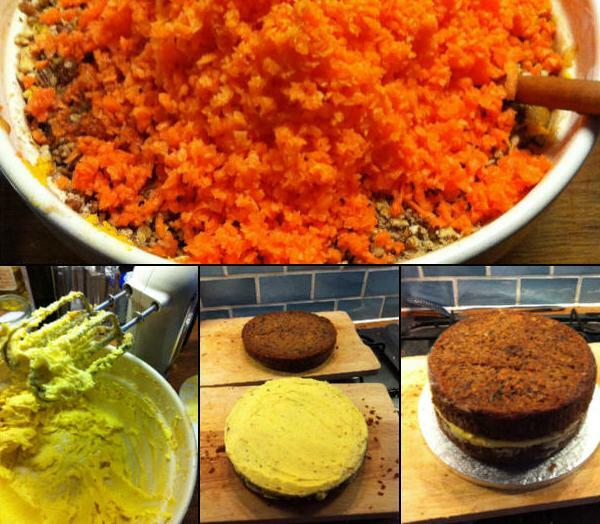 It gave me an understanding of what goes into those amazing cakes you see in stores and at weddings. The books I referred to were indispensible — aside from Mich Turner, whose book I already mentioned, I took loads of amazing tips from Juliet Sears, whose cake-decorating book I recently copy-edited. 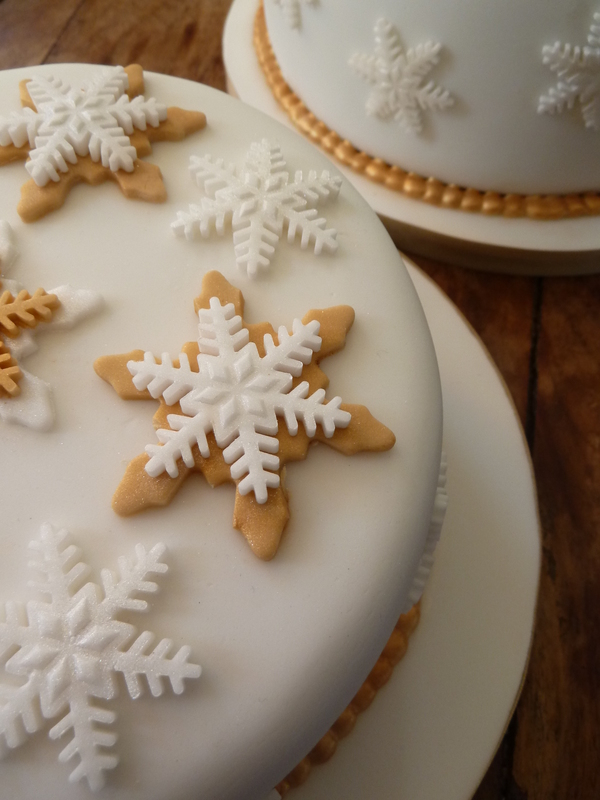 This entry was posted in Baking, Cake, Christmas, Recipes and tagged cake, Christmas, cinnamon, food & drink, nuts, recipes, spices, winter by ionelou7. Bookmark the permalink. 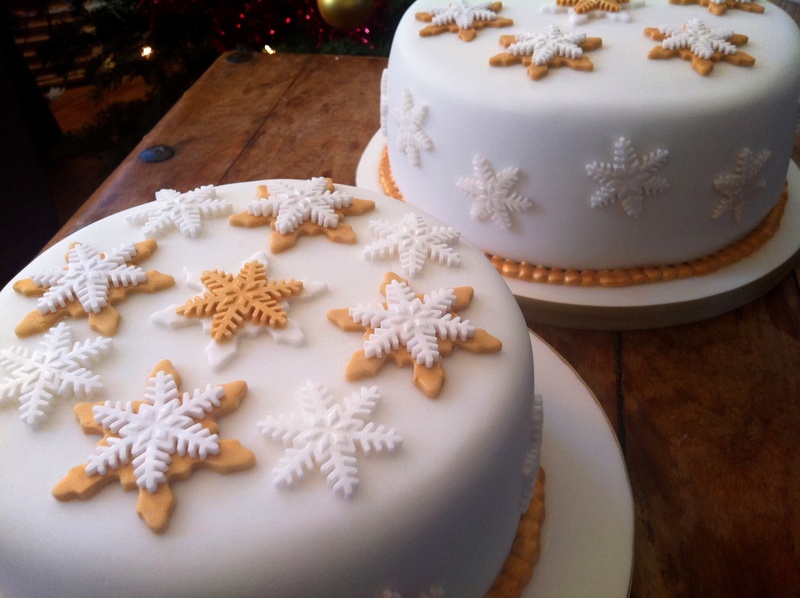 These cakes are gorgeous! Great job! wow that looks amazing! i wished my cakes (only made 2 ever) looked 1/10 as good!